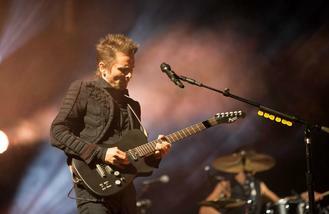 News - Muse to have stage of magnets on next tour? Muse to have stage of magnets on next tour? Glen Rowe - who has been the rock group's tour manger on-and-off throughout their career since 2000 - has revealed the 'Psycho' hitmakers' elaborate plan to use pieces of material that connect on stage, which will allow the trio - comprised of Matt Bellamy, Chris Wolstenholme and Dominic Howard - to "levitate" from them. Speaking at the MUSEXPO conference, he explained: "We want to do a stage made of magnets so the band can levitate on other magnets. It's those questions that keep me awake every night of my life. If there are any magnet technicians out there, please come and see me because that's what we're trying to achieve." Glen - who has worked on shows with the likes of the Manic Street Preachers, The Kooks and The Zutons in the past - says his "permanent challenge" is trying to up the band's game in terms of stage production. He added: "It is ridiculous, but trying to dream up something more adventurous is always our challenge, where does the next bolt of lightning come where you capture the essence of it and trying to put it into a record or a tour, it's definitely my permanent challenge." The British rockers used drones on their aptly-named 'Drones Tour' in April and a stage inspired by popular 1980s puzzle video game 'Tetris' at Glastonbury Festival.